The Northwestern University athletic teams are known as the Wildcats. Northwestern University fields varsity teams in the NCAA Division FBS and is a founding member of the Big Ten Conference. Northwestern football traces its roots to 1876, the team’s official year of organization, and played its first game against Lake Forest. Northwestern plays its home games at 47,130 seat Ryan Field in Evanston, Illinois. The Northwestern Wildcats football team has won eight Big Ten Conference titles, most recently in 2000. The official site of Northwestern Wildcats Athletics is NUSports.com. The Northwestern football team head coach is Pat Fitzgerald. Learn more about Coach Fitzgerald, here. Northwestern University is a highly selective, private, nonsectarian, coeducational research university located in Evanston, Illinois, a suburb of Chicago. Founded in 1851, NU has an enrollment of 19,000 students. The official Northwestern University Academic website can be found at northwestern.edu. Ryan Field Football Gameday is an excellent source of Northwestern football information featuring traffic tips and directions, Ryan Field parking, and NU Wildcats Gameday tailgating activities. The home of the NU Wildcats football team is Ryan Field. The facility opened in 1926 and has an official capacity of 47,130. Get the best prices on tickets to Northwestern University football games. You can comparison shop at one place online all the major sporting event ticket outlets at Big Ten Football Tickets. Big Ten Online has the cheapest price on Northwestern football tickets. Big Ten Football Online compiles all the local network radio listings so fans of Northwestern University sports can listen to Northwestern football games online. Find out where you can listen to Northwestern football online at Big Ten Football Radio Online. We have future Northwestern football schedules for the upcoming seasons. View the 2016 Big Ten Football Schedule Grid and the 2017 Big Ten Football Schedule Grid at Big Ten Football Online. Get access to all Big Ten football games, highlights, and replays on the Big Ten Network. 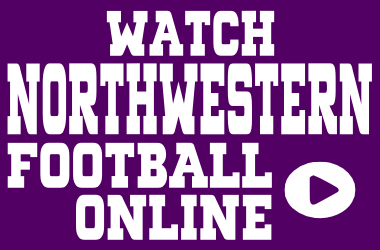 Find out where you can watch Northwestern football online at Watch Big Ten Football Online. Big Ten Online is the best place to watch the Northwestern football game online. Northwestern Gameday Central…Live coverage of Northwestern football games online. Find NU Wildcats football wallpaper for cell phones and computers, Northwestern screensavers, and Northwestern backgrounds at our free Northwestern football wallpaper page. Go U! NU! is an NU Wildcats football cheer and Go U Northwestern is the official Northwestern Wildcats fight song. Download free Northwestern ringtones at Northwestern fight song ringtones. The most popular sports message board forums for Northwestern Football are the Rock and Purple Reign, a member of the Scout.com network. Hail to Purple…A very unofficial site for Northwestern Wildcat Football. Lake the Posts…The definitive blog dedicated to Northwestern football. Northwestern Football History…A history of NU football from the Northwestern University archives. Inside NU…Independent source for NU Sports. Purple Wildcats…A member of the Scout network. Wildcat Report…A member of the Rivals network. Daily Northwestern…Official Northwestern University student newspaper. ChicagoSports.com…Northwestern football coverage from the Chicago Tribune. North by Northwestern…Local Coverage of Northwestern Athletics. WNUR Sports is the official student radio station at Northwestern University. Listen to Northwestern football online game streams.